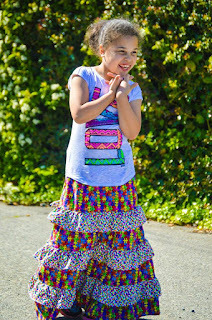 Amazing Adventures With Bubba and Bug: Point Mugu Maxi Skirt! Recently, I saw a testing call that just screamed my daughter's name! 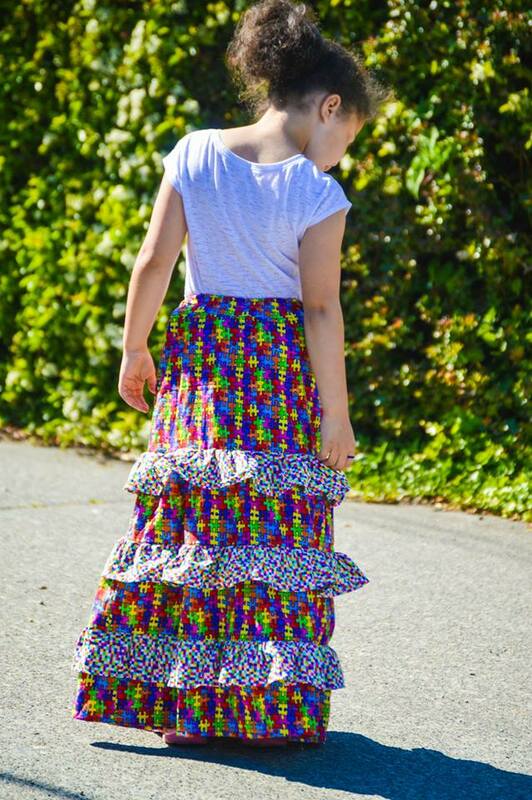 Although I was not familiar with the designer, I applied to make this adorable maxi skirt. 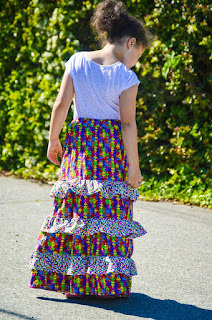 The Point Mugu Maxi Skirt by Seaside Notions turned out to be just as perfect as I suspected it would be. 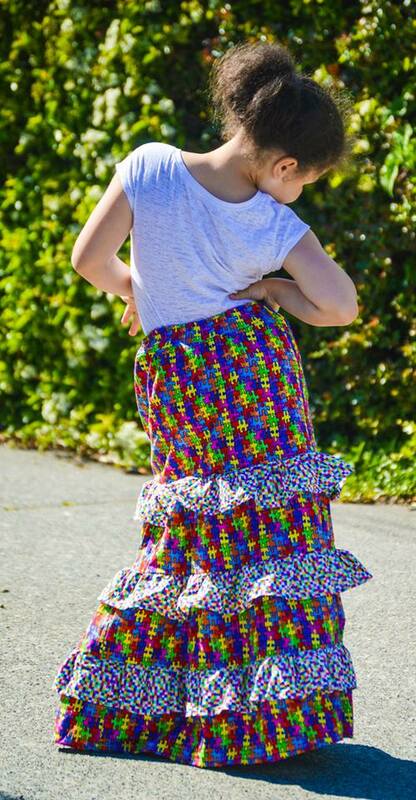 This pattern ranges in size from 12 months to 14 years. The pattern is well written and easy to understand as well as easy to customize for the perfect fit. I also love that there is the option of simply using a measurement chart or printing pattern pieces to please any consumer. 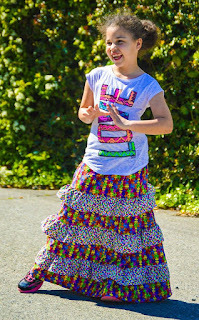 The tiered skirt allows for any mixture of your favorite woven fabrics but my daughter already had her eye on a few fabrics from my stash. We are big supporters of Autism Awareness due to the passion my son has for working with young children who are autistic. I am working so hard to teach my children to love people for their differences and respect what makes us all special. My daughter is no different and wanted to show her support. 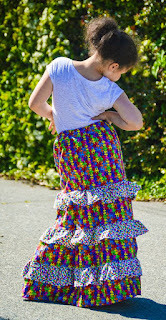 My daughter is so girly that the ruffles were right up her alley and the skirt touched the ground when she bent her knees slightly so she was in heaven! The skirt isn't heavy on her and she can run and play just like she always does. She is really just in love! I would suggest a thinner woven for summer time wear. Both of these fabrics were super thin and flowy allowed her the skirt motion she craves. Isn't happiness like this what we all strive for? Join the Facebook Group or just head over and buy yourself a copy here using the code BLOGTOUR to get 20% off! So go make your little girl just as happy! Or enter below to win fabulous prizes!!!! 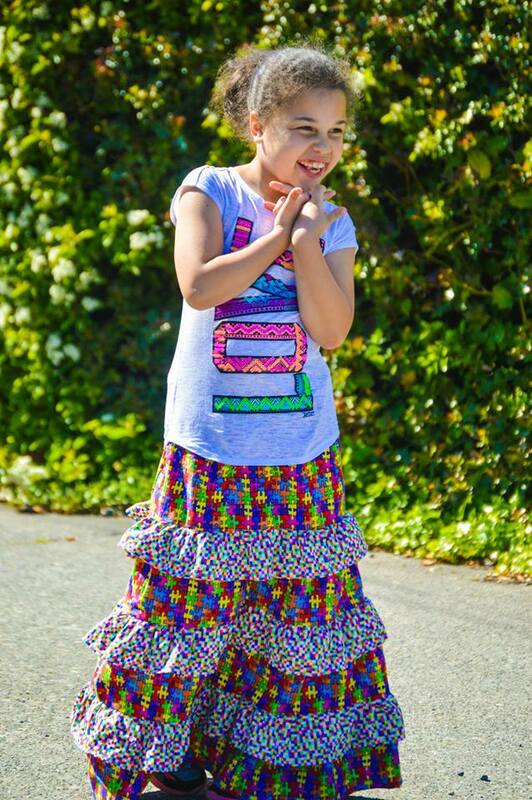 LOVE your fabric <3 My brother is on the spectrum, the puzzle pieces have a special place in my heart too! I keep eyeing this skirt - my daughters wouldn't like it right now, but I love the design! Different from the rest of the maxi skirts out there. You did an amazing job, she looks so happy! I love your fabric and the way this looks on her! So cute!! !